Vector-borne pathogens are emerging concerns in multiple regions of Canada. Determining regional prevalence of canine vector-borne pathogens and documenting change will improve clinician awareness, enable targeted prevention, enhance diagnosis and ideally reduce the risk of disease. Study objectives were to: (i) estimate the prevalence of positive canine vector-borne test results from samples submitted in Canada; (ii) assess change in prevalence over time, from baseline (2008) to 2015; and (iii) estimate the prevalence of pathogen co-infections. This repeat cross-sectional study evaluated 753,468 test results for D. immitis antigen and B. burgdorferi, Ehrlichia canis/ewingii/muris serology, and 753,208 test results for Anaplasma phagocytophilum/platys serology using the SNAP® 4Dx®Test and SNAP 4Dx® Plus Test. Based on all submitted samples from Canada (2008–2015), the period seroprevalence of B. burgdorferi, Ehrlichia spp., Anaplasma spp. and D. immitis antigen were 2.0%, 0.5%, 0.4% and 0.2%, respectively. Over the 7 years (2008 compared to 2015) we observed a significant increase in seroprevalence for B. burgdorferi (144.4%) and Ehrlichia spp. (150%). Co-infections (positive for two or more pathogens on a single 4 pathogen test kit) were estimated at 5.4% (1162/21,612) of total positive tests. The temporal rise and geographical differences in prevalence detected for these pathogens (notably B. burgdorferi) are consistent with anecdotal information on canine illness related to tick-borne pathogen exposure in multiple regions of Canada, particularly canine Lyme disease. Geographical ranges of ticks and their associated vector-borne pathogens, notably Ixodes scapularis and the spirochete Borrelia burgdorferi, are rapidly expanding in central, eastern and Atlantic Canada [1–6]. There is increasing concern over the emergence of tick-borne pathogens, such as B. burgdorferi, Anaplasma spp. and Ehrlichia spp. and the diseases they can cause in dogs [7–9]. Clinical signs related to these tick-borne pathogens are frequently vague and may include fever and shifting limb lameness [7–11]. However, severe clinicopathologic changes and disease can occur, such as Lyme nephritis [8, 10], thrombocytopenia or death due to Ehrlichia or Anaplasma spp. [9, 11]. Testing for B. burgdorferi, Anaplasma and Ehrlichia spp. serostatus is commonly performed in dogs in conjunction with annual heartworm (D. immitis) screening. This widespread testing provides abundant prevalence data and an avenue for surveillance through analyses of large datasets of reported test results for vector-borne pathogen exposure and infection in dogs. This technique has been used to monitor for pathogen prevalence in dogs in the USA and Canada over the past decade [5, 12, 13]. Reported prevalence of canine vector-borne pathogens in Canada has varied by study, with respect to variation in geography (local and regional), year performed and test methodology [5, 14–18]. 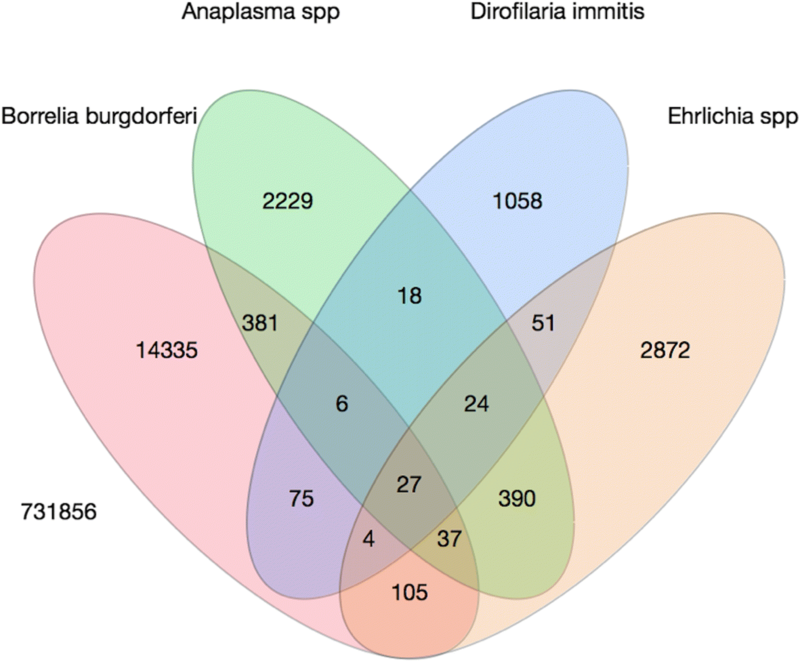 One publication using data contained within our study period (2013–2014), estimated national canine seroprevalence for B. burgdorferi as 2.5% based on 115,636 tests . Mosquitoes transmit D. immitis larvae, which can develop into adult worms and lodge in the canine pulmonary system leading to severe pathology and death without therapy. In Canada, heartworm prevalence is currently considered low (< 0.5 %) ; however, regional prevalence estimates have varied [5, 15]. Our aims were to investigate the overall prevalence of positive test results for B. burgdorferi, E. canis/ewingii/muris, A. phagocytophilum/platys and D. immitis in dogs across Canada tested using a widely used commercial assay, assess broad-scale temporal (annual) and spatial (province) change, and provide a current estimate of prevalence and co-infection prevalence in Canada. A total of 753,468 test results were available for B. burgdorferi, Ehrlichia spp. and D. immitis, with results for Anaplasma spp. available for 753,208. Tests were predominantly from Ontario (ON) 75% (n = 564,552), Quebec (QC) 13% (n = 95,898) and Manitoba (MB) 9.6% (n = 72,254). The remaining provinces and territories each consisted of < 1% (n = 20,764) of test results (Table 1). No results were obtained from the Northwest Territories or Nunavut. Prince Edward Island (PE) and the Yukon were excluded from provincial comparisons due to small sample sizes (n = 3 and n = 12, respectively). There was a 2142% increase in annual test submissions over the study period, from 8082 (2008) to 181,205 (2015). Over the 8-year period, 2.0% of all samples were positive for B. burgdorferi, 0.5% for Ehrlichia spp., 0.4% for Anaplasma spp. and 0.2% for D. immitis (Table 1). Overall, there were significant geographical differences in pathogen period prevalence (Table 1) and increasing trends in percent positive results in dogs from Ontario, Manitoba and Quebec over the study timeframe for all tick-borne pathogens (Additional files 1, 2, 3: Figures S1-S3), with marked positive change for B. burgdorferi. Annual seroprevalence for B. burgdorferi significantly increased (144% increase) over the study timeframe, from 0.9% to 2.2% (Cuzick test of trend: Z = 17.10, P < 0.001; Table 2). Similarly, there was a significant increase (150% increase) in Ehrlichia spp. annual seropositivity (Table 2) from 0.2% to 0.5% (Cuzick test of trend: Z = 10.98, P < 0.001). Nationally, significant linear trends were not detected in the annual prevalence of D. immitis or Anaplasma spp. (Table 2). Co-infections, defined as a positive result to two or more pathogens from the same sample, were identified in 5.4% (1162) of all positive tests (21,612) (Fig. 1). Co-infections were observed between all pathogens, and most common between: Anaplasma and Ehrlichia spp. (2.2%; n = 478/21,595), B. burgdorferi and Anaplasma spp. (2.1%; n = 451/21,595), and B. burgdorferi and Ehrlichia spp. (0.8%; 173/21,612). The seroprevalence of B. burgdorferi significantly varied across the provinces (Table 1). The odds of B. burgdorferi seropositivity were significantly greater in MB (2.4%), QC (2.3%), Nova Scotia (NS) (9.5%) and New Brunswick (NB) (7.4%) than ON (1.8%; referent). Seroprevalence was significantly lower in Alberta (AB) (0.8%) and British Columbia (BC) (0.5%) than ON (1.8%; referent). Annual B. burgdorferi seroprevalence significantly increased between 2008 and 2015 in central, eastern and Atlantic Canada, with the greatest magnitude of change observed for MB (146.2%), ON (216.7%), QC (233.3%), and NS (441.7%); (all Cuzick test of trend: all Z > 8.60, all P < 0.001; Table 2). The complex province-specific temporal changes in B. burgdorferi seroprevalence were identified in the multivariable model (Table 3); year, year2, province and all two-way interactions were retained in the final model. Predictive probability plots of this model (Fig. 2) highlighted the significant increases in seroprevalence in ON, MB and QC. While seroprevalence appeared to be levelling by the end of the study period (2015) in ON (1.9%) and QC (3.0%), this was not observed in MB where seroprevalence was relatively high (3.2%) and continued to rise over the study period (Fig. 2). Seroprevalence for Ehrlichia spp. (Table 1) varied significantly among the provinces. The odds of Ehrlichia spp. seroprevalence was significantly greater than ON (0.4%; referent) in all provinces, with the exception of MB which was significantly lower (0.3%) (Table 1). This elevated seroprevalence was most evident in the western Canadian provinces of AB (4.9%) and BC (6.6%). 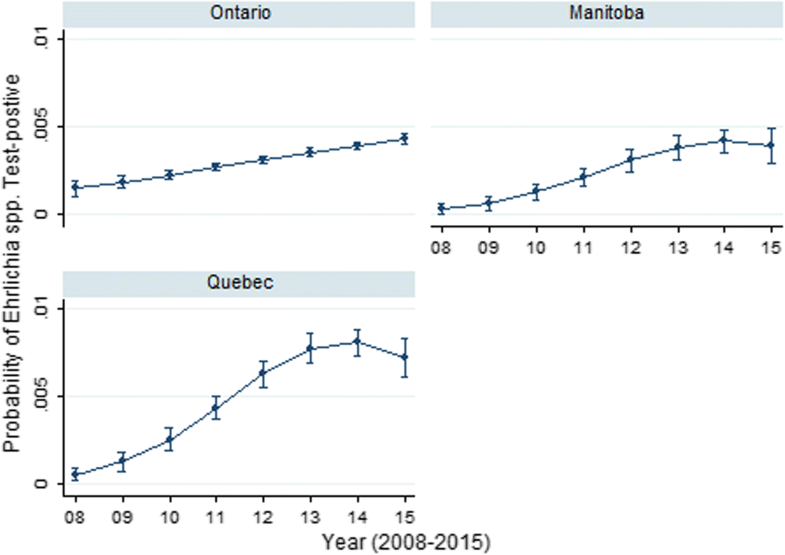 Annual seroprevalence significantly increased between 2008 and 2015 in western (BC, AB), central (MB) and eastern Canada (ON, QC) (Table 2), particularly within Alberta, Ontario and Quebec (325%, 400% and 600% increase, respectively). The complex province-specific temporal changes in Ehrlichia spp. seroprevalence were identified in the multivariable model (Table 3); year, year2, province and all two-way interactions were retained in the final model. Predictive probability plots of this model (Fig. 3) highlighted the dramatic differences in seroprevalence across the study period in Ontario, Manitoba and Quebec. There were significant increases in Ehrlichia spp. seroprevalence in QC and MB (Fig. 3) with possible levelling of prevalence in 2014/2015. In contrast, a gradual linear increase was observed in ON (Fig. 3). Period seroprevalence for Anaplasma spp. (Table 1) varied significantly geographically. Odds of Anaplasma spp. seropositivity were higher in all provinces, except Saskatchewan (SK) and Newfoundland (NL), than in ON (0.3%; referent) (Table 1). Provinces with significant annual change, and the greatest magnitude of serological change (Table 2) were Manitoba and Quebec (233.3% and 185.7% positive increase, respectively). The province-specific temporal changes in Anaplasma spp. seroprevalence were identified in the multivariable model (Table 3); year, year2, province and all two-way interactions were retained in the final model. Predictive probability plots of this model (Fig. 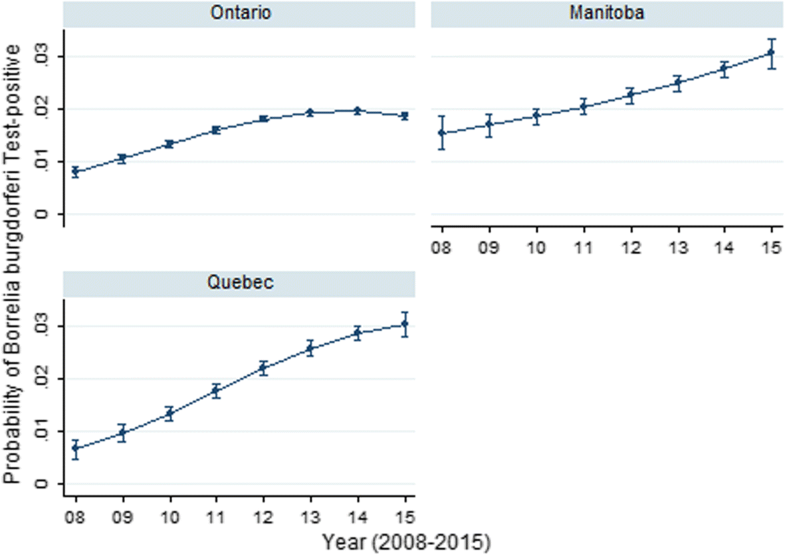 4) highlighted the temporal differences in seroprevalence across the study period in Ontario, Manitoba and Quebec. There were initial increases with eventual levelling (2013–2015) in Anaplasma spp. seroprevalence in three provinces (ON, MB, QC). These findings were most pronounced in Manitoba. The odds of a dog being D. immitis-antigen positive were significantly greater in Quebec (0.3%) and Manitoba (0.4%) than Ontario (0.1%; referent) (Table 1). 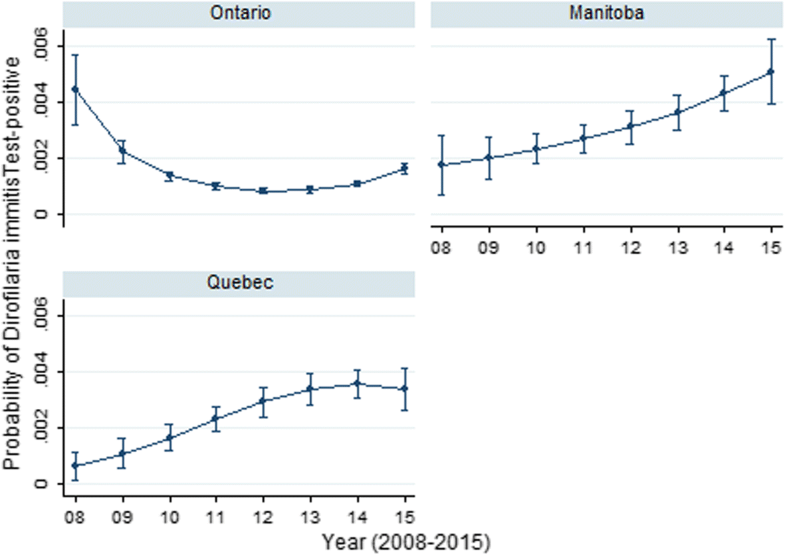 Over the study period, a significant positive annual trend in D. immitis antigen prevalence was noted in Manitoba (733.3% increase), while in Quebec, a significant annual decrease was observed (-25%). The changes in time in the predicted odds of a D. immitis antigen test varied among ON, MB, QC (Fig. 5); year, year2, province and all two-way interactions were retained in the final model. In Ontario, D. immitis prevalence showed a sharp decline before levelling off between 2013–2015, while Manitoba and Quebec revealed overall increasing trends in prevalence (Fig. 5). The current study provides an important estimation of recent trends in canine vector-borne disease seroprevalence in Canada. Borrelia burgdorferi was the most common and widespread of the vector-borne pathogens that were evaluated. The seroprevalence noted here (2% over the 8-year study timeframe, 2.2% in 2015) was similar to a recent publication (2.5% nationally, 2013–2014) . Not surprisingly, B. burgdorferi seroprevalences in our study were highest in Manitoba, Ontario, Quebec, New Brunswick and Nova Scotia. These are all provinces which contain recognized high-risk human Lyme disease regions [1, 3, 19–22]. The geographical variation and differences noted within Canada were expected, given disparities in national climate, which is a driving factor for Ixodes scapularis range and expansion [1–4]. The B. burgdorferi seroprevalence in Atlantic (NS), eastern (ON, QC) and central (MB) Canada displayed an overall increase over the 8-year study timeframe. The 2015 results from these higher seroprevalence regions are similar to adjacent regions in the United States [12, 13], and reported increased human Lyme disease incidence regions in Canada . Canadian canine seroprevalence for Anaplasma spp. has been similarly evaluated and reported as below 0.5% (same test methodology) . Until recently it was hypothesized that there was a very low risk of dog exposure for Anaplasma spp., specifically in Ontario [4, 23]. In contrast, another study performed in a region adjacent to Canada  found an increase in positive Anaplasma spp. serology in dogs from the Northeastern USA in 2010–2012 compared to 2001–2006 . In dogs, anaplasmosis is due to exposure and infection with Anaplasma phagocytophilum or A. platys [11, 24]. Similar to B. burgdorferi, A. phagocytophilum is transmitted by I. scapularis and I. pacificus ticks [4, 11, 25]. However, A. platys is transmitted by Rhipicephalus sanguineous, a tick that is not believed to be established in Canada . Due to their similar tick vector (I. scapularis and I. pacificus), A. phagocytophilum and B. burgdorferi may co-localize (i.e. tick infected with both pathogens) . Tick co-localization of pathogens and the increasing number of I. scapularis ticks in these regions may provide an explanation for the annual prevalence increases in Anaplasma spp. seropositivity we noted in Manitoba, Nova Scotia, Quebec and Ontario. This finding may be further supported by the observed co-infections between Anaplasma spp. and B. burgdorferi. However, potential pathogen cross reaction in testing cannot be discounted and may, at least in part, be responsible for this increase . In Canadian dogs, nation-wide Ehrlichia spp. seroprevalence has been reported as below 0.5% . Other provincial studies have determined seroprevalence for E. canis as 3.2% (with 6/9 positive test results from Ontario) and 0% (n = 285) for E. chaffeensis or E. ewingii . At present E. canis and E. muris-like agent (EMLA) appear to be the most likely clinically relevant Ehrlichia spp. in Canadian dogs. This is presumed due to their respective tick vector presence in the country, i.e. Dermacentor variabilis (E. canis) [28, 29] and I. scapularis, I. cookei (EMLA) [30, 31]. However, D. variabilis has only been shown to be experimentally infected with E. canis, so its role in natural infection and exposure in dogs is unclear . Seroprevalence is increasing in the USA for E. ewingii , and it is considered an emerging vector-borne pathogen in dogs and humans. However, while both R. sanguineus and A. americanum have been reported in Canada  and can be infected with E. ewingii, neither are believed to be established ticks. The change in prevalence for Ehrlichia spp. noted in Ontario and Quebec may be due to the presence of I. scapularis- and I. cookei-transmitted E. muris-like agent (EMLA), which has been documented in the adjacent mid-western USA region [30, 31, 33], E. canis or potentially due to E. ewingii vectored by emerging tick species. However, as neither R. sanguineus or A. americanum have been documented in Canada as established tick species  they would appear unlikely as vectors of Ehrlichia spp. to the extent we documented increasing seroprevalence in our study. As mentioned, cross-reaction can occur, and this may have resulted in some test misinterpretation and subsequent findings [27, 33]. Overall, the prevalence of heartworm was low and consistent with other studies . 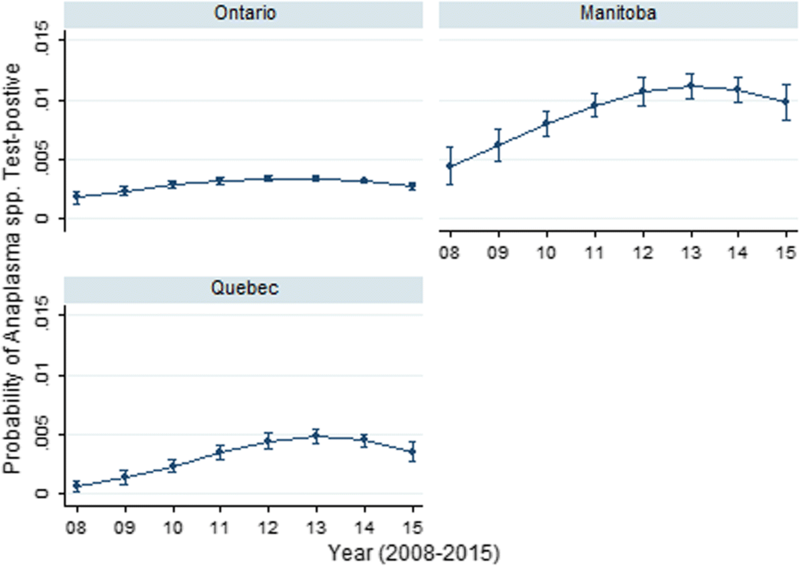 However, a significant increase in prevalence was noted over the study time-frame in Manitoba. The range of competent mosquito vectors for this pathogen has been shown to have expanded northward , and other mosquito-borne pathogens are known to be present within this province . This temporal rise in prevalence may also reflect a change in testing (e.g. increase in testing dogs with cardio-respiratory signs, recently imported dogs). The tick vector of B. burgdorferi is known to carry other pathogens within Canada, and co-pathogen presence may complicate diagnosis, disease and therapy [8, 24, 36]. Co-infections were briefly described in an earlier Canadian study, with B. burgdorferi and Anaplasma spp. co-infection as 4.1%, and B. burgdorferi and D. immitis at 1.1% . In this study, dogs with co-infection were more likely to be ill . We estimated co-infections in 5% of all animals with at least one positive test, and this emphasizes the need for effective vector-borne disease prevention by Canadian veterinarians beyond reliance on vaccination for Lyme disease. Limitations of prevalence studies such as the present work primarily relate to reporting bias, lack of travel history or confirmatory testing information on dogs [5, 12, 13]. Similarly, we cannot discount the possibility that differences in the proportion of tests being used for screening compared to clinical disease diagnoses may have resulted in the regional and temporal changes identified in seroprevalence. Further, although the tests used in this study have reported high sensitivities and specificities [27, 37–39], positive predictive values may be greatly affected by exposure and infection prevalence in specific geographies [40, 41]. The reported test specificity for B. burgdorferi using the SNAP 4Dx® Plus Test is 98.8% , and as such there is a potential for false positives. However, the geographical and temporal variations that were observed within this dataset, along with the multivariable analyses and predictive probabilities for Ontario, Manitoba and Quebec suggest that the specificity may be better than reported. As such, low prevalences are likely indicative of true positive results, rather than false positives. In Canada, the distribution of several tick species is changing rapidly [1, 4, 42] and tick species emergence have been reported, e.g. A. americanum. Importation of livestock and companion animals, along with human travel with their animals have likely added to this distribution effect . Emergence of ticks, range expansion and increased tick numbers have been documented, and this is most noteable with I. scapularis in central, eastern and Atlantic Canada [4, 21]. Similarly, albeit to a lesser extent, geographical range has increased for both D. variabilis and D. andersoni within central and western Canada . The serological findings in our study echo this observed temporal and geographical change in tick vector range, and highlight the consequences of tick bite, attachment, subsequent exposure, infection and potential disease in dogs. Significant differences among provinces in their pathogen period seroprevalences were observed, and significant trends over the course of the study within several provinces described. In provinces where we had sufficient power to conduct multivariable analyses, we noted that changes in prevalence over time were frequently not linear and the differences between provinces (i.e. Manitoba, Ontario, and Quebec) were not constant over time. These findings illustrate the importance of such modeling approaches, considering appropriate temporal and spatial units of measure, to allow for meaningful conclusions for these vector-borne pathogens. As testing increases throughout Canada, a similar approach will likely be useful to investigate these relationships in other Canadian provinces. This study builds on others performed in Canada and documents the prevalence of exposure and infection to common vector-borne pathogens in dogs, particularly the increase in prevalence of tick-borne pathogens. These geographical differences and temporal increases are most notable for B. burgdorferi in central, eastern and Atlantic Canada. However, significant positive increases were observed for Ehrlichia spp. (AB, ON, QC) and Anaplasma spp. (MB, ON, QC, NS). The substantial temporal changes in seroprevalence over the 8-year period observed within specific provinces highlights the rapid change in vector-borne pathogen presence. Ideally, the results of our findings will raise clinician awareness, increase canine and human tick prevention attention and prioritization, and reduce the risk of disease. This repeated cross-sectional study utilized 753,468 test results for D. immitis antigen testing and B. burgdorferi, Ehrlichia canis/ewingii/muris serology, and 753,208 test results for Anaplasma phagocytophilum/platys serology submitted between 2008–2015. Data were obtained from an in-clinic ELISA test SNAP® 4Dx® (IDEXX Laboratories, Inc., Westbrook, Maine), and after 2012 the 4Dx® Plus Test (IDEXX Laboratories, Inc., Westbrook, Maine) tests that have been validated in dogs [27, 45]. Test results were generated by veterinary clinics and commercial veterinary diagnostic labs on dogs in Canada between 2008–2015. The majority of tests were analysed by the diagnostic laboratory, with a subset recorded manually in-clinic. Geography (clinic postal code) data were available. A small portion (n = 115,636, years 2013–2014) of the dataset overlaps with an earlier publication . Dogs were presumed to live with their owners and receive routine care through their veterinary clinic. Clinical data were not available, but it was presumed that most dogs were healthy and tested for the purpose of annual heartworm screening. Postal code of reporting veterinary practice was used to collate data by provinces. Univariable logistic regression was used to assess associations between a test result (outcome; performed for each of the four pathogens) and province. Odds ratios (OR) and the associated P-values were calculated for each pathogen. The non-parametric Cuzick test of trend was used for assessing associations between pathogen prevalence and year. Co-infections were visualized through a Venn diagram. For provinces with sufficient positive and negative test results (Ontario, Manitoba, Quebec), multivariable logistic regression was used to assess the association between the odds of testing positive for these pathogens and the independent variables province and year. The linearity assumption for year was assessed by examining a lowess smoother plot of the log odds of the outcome against year, and by testing the statistical significance of the inclusion of a quadratic form for year (i.e. year2). If the relationship was not linear, year was modelled as a quadratic effect if appropriate, otherwise year was modeled as a categorical variable. A manual step-wise backward building procedure was used to create main-effects models. Prior to removal, likelihood ratio tests were used to assess the significance of each predictor. All two-way interactions between variables in the main-effects model (e.g. province, year, year2) were eligible for inclusion. Variables were retained in the final model if they were significant predictors for the given pathogen, part of a significant interaction term or acted as a confounding variable. A confounding variable was defined as a non-intervening variable whose removal resulted in a ≥ 20% change of another variable in the model . Coefficients and 95% confidence intervals (CI) for the coefficients were reported for each pathogen. Annual predictive probabilities for a positive test result (along with 95% CIs) from final multivariable models were visualized through province-specific plots. Analyses were performed using commercial software (Stata version 13.1; StataCorp LP, College Station, TX). A significance level of 5% was used for all analysis. The authors wish to thank the Canadian veterinary community. The study was supported through an Ontario Veterinary College Pet Trust grant and IDEXX Laboratories, Inc. The dataset used and analyzed by the authors during the present study are available from the corresponding author upon reasonable request. The authors (JB, RC, TOC and ZL) with IDEXX Laboratories, Inc. were involved in study data collection. All authors (ME, JWS, DP, AP, CJ, JB, RC, TOC, ZL, JSW) made substantial contributions to study analyses and interpretation and were involved in drafting and revising the manuscript. All authors read and approved the final manuscript. JB, RC, TOC and ZL are employed by IDEXX Laboratories, Inc. The authors declare that none of their collaborations influenced this work. The authors perform collaborative research with IDEXX Laboratories, Inc. (ME, JWS and JSW), the American Kennel Club-Canine Health Foundation (ME, JWS and JSW), Zoetis Canada (ME), and act as consultant(s) or have participated in sponsored CE events with Merck USA (ME and JWS) and the American Kennel Club-Canine Health Foundation (ME and JWS). Public Health Ontario. Lyme Disease Risk Areas Map. 2018. https://www.publichealthontario.ca/en/eRepository/Lyme_disease_risk_areas_map.pdf. Accessed 3 Dec 2018.